Triple Strand Freshwater Pink to Peach pearls, 6-7 mm, beautiful natural color, AA+ or AAA. This 17-18-19 inch nested-strand is finished with a polished 14-karat gold clasp. Yellow or White gold. Triple Strand Natural Pink to Peach Freshwater Pearl Necklace, 6-7 mm, AA+ or AAA. This 17-18-19 inch nested-strand is double-knotted on silk and finished with a polished 14-karat gold bar-style clasp. 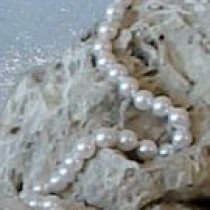 Netpearls.co.uk is proud to offer the highest quality freshwater pearls. The shape is very near perfect and the pearls exhibit a sharp luster and clean surfaces. The pink to peach coloration is completely natural and not the result of any color treatments, for this reason the pearls of the necklace you'll receive may be slightly different in tones from the ones pictured here. The shape of these pearls is near-round to round (AAA) or off-round to very near-round (AA+). 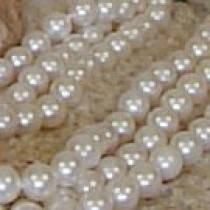 The pearls are individually knotted on twin silk and finished with a 14-karat gold clasp. You have the choice between Yellow and White gold.